In this second blog, we look at yet another superb player for the franchise of the Dallas Cowboys in legendary Running Back Emmitt Smith. Hailing from the University of Florida, he was selected in the first round of the 1990 draft in the Cowboys effort to rebuild their franchise. It soon paid off as he won Offensive Rookie of the Year during the 1990 year. As show in the statistics above, Smith can be proven to be one of the greatest running backs in the history of the NFL and the best running back for the Cowboys ever. 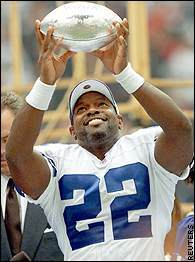 Along with his 164 rushing touchdowns and 18,355 total running yards, he won the the MVP Award during the 1993 reason and led the Cowboys to three Super Bowl wins during the ’90s. Forever, Number 22 will always be remembered as a legend.